Winner of a 2010 Parents' Choice Recommended Award! Established in 1978, Parents' Choice is the nation's oldest nonprofit guide to quality children's media and toys. The Foundation's purpose is to search out and recommend products that help kids grow -- imaginatively, physically, morally and mentally -- fairly priced products that are fun, safe and socially sound. Honored as a 2010 National Parenting Publications Awards (NAPPA) "Rising Star"! Sharing the Same Stars has received special recognition from NAPPA in its brand new "Rising Stars" category, which honors a select number of Children's Products that reflect great potential. The National Parenting Publications Awards are your guide to the best gifts for kids and resources for parents. "Great range of musical styles with catchy songs that make kids laugh, think, learn and feel." Click here for the NAPPA website and to see all the "Rising Stars" winners. Winner of the prestigious Preferred Choice Award from Creative Child Magazine! Creative Child Magazine is a national bi-monthly publication that provides parents with the latest information on how to nurture their child's creativity. Creative Child Magazine's Toy Awards Program is unique in that all products submitted are reviewed by moms, music educators and early education professionals. Click here for our Creative Child Magazine Award page! Recipient of a 2011 and 2010 ASCAPLUS Songwriting Award! The American Society of Composers, Authors and Publishers (ASCAP) has honored Ilene Altman (aka Leeny) with an ASCAPLUS Award in the Popular Music category. The ASCAPLUS Awards Program is for writer members of any genre whose performances are primarily in venues not surveyed; and/or writer members whose catalogs have prestige value for which they would not otherwise be compensated. Established in 1914, ASCAP is a membership association of more than 400,000 composers, songwriters, lyricists, and music publishers. ASCAP is the only U.S. performing rights organization created and controlled by its members. Nominated for Song of the Year in the 10th Annual Independent Music Awards! "Ladybug, Ladybug, Ladybu-u-ug" has been nominated for an Independent Music Award (IMA) in the Children's Song category. Click here to check out Leeny's Q&A with the IMA! "We were given this CD as a gift and haven't stopped listening to it. Our almost-four-year old can't get enough, but I bet older kids would sing (and laugh!) along with gusto too. It reminds me of my favorite album from when I was little -- Free to Be You and Me. Some of the songs have a similarly inspiring message about being comfortable in your own skin. But it also has songs that are educational 'for the whole family'. I say that because the song about Ladybugs taught me much more than I ever knew about the insects. There are also songs about skin, vitamin C and the 50 states. The song Hold It will be an instant favorite with any kid in the 'potty talk' phase -- but it's so good-natured and funny, that you might find yourself singing along too." "Leeny and Tamara have created a really fun, really catchy set of songs that actually teach us things. I've found myself saying things like, 'Did you know there are over five thousand species of ladybugs? And some of them are blue!' or 'Did you know that other animals can produce their own vitamin C, but humans have lost that ability and that's why we need to eat oranges or we may get scurvy?' Yeah, I'm a riot at parties. Their song, It's Cool To Be You highlights the fact that we all have our own talents and we're all different. My son Ivan is blind and can't walk and I can't remember ever hearing a song that actually admits that 'Some wheel around in chairs; Some can't hear and some can't see.' It's refreshing." "Leeny and Tamara's music is charming and thoughtful, with hummable melodies, pristine studio production, and countless little touches that will make both you and your kids smile. Their lyrics are geared toward kids ten and under, with topics that both teach and entertain. One of our favorite songs is Hold It, a wistful tune about having to pee really bad. We've all been there. Another standout is I Used To Be Shy, a thoughtful little tale of overcoming childhood shyness set to a bouncy pop melody. Most of this album is a mix of piano pop and guitar rock, with a touch of new wave, country, and rockabilly spread throughout. Leeny and Tamara beautifully harmonize from beginning to end. They have produced a wonderful set of songs that will please you and your kids for many years. Sharing The Same Stars receives my family's highest recommendation!" (Phil also emailed us to say: "I Used To Be Shy is now in my Top 25 All Time Kids Songs!" "Intelligent and catchy children's music that will appeal to adults as well as children. Highly informational and highly entertaining tunes. A mix of musical styles and tempos will keep kids and parents involved. I suspect a live performance would be highly entertaining." "One of the best albums of children's music on the market today. The songs cover a myriad of topics -- seat belts, sharing, shyness, ladybugs, little sisters, babies, beaches, and being born backwards -- to engage not only little listeners but parents as well." -- John Stevens, Associate Professor, Berklee College of Music, Author of "The Songs of John Lennon: The Beatles Years"
"I tend to have little patience with kids songs, so my son has grown up with African Jazz and Bach and all sorts of things, but a dearth of singable happy tunes. We BOTH love Leeny and Tamara's songs! They have great voices and a wonderful earnestness about every single lyric." "I love it!!! Congratulations on a wonderful and successful album for children and thank you." "In our house, we don't do 'kids' music a lot because so much of it is just too hard for musician parents to tolerate. But Sharing the Same Stars is something you can enjoy as a parent and a lover of great songs!" "The album opens with the jazzy strains of Put on My Seat Belt and segues into the Beach Boys-ish pop crunch of Taking Turns, a terrific one-two punch that sets the wonderfully catchy tone for the rest of the disc. Leeny and Tamara trade lead vocals, and they're both gifted with bright, clear voices that fit these sunny tunes perfectly, while producer Art Hays does a tremendous job of turning a pile of overdubs into something that sounds like the work of a room full of ace session players. The songs are both educational My Baby runs through the names for different species' young; Your Epidermis Is Showing is a two-and-a-half minute skin gag; Vitamin C is... well, you get the idea) and uplifting (Little Sister addresses sibling conflicts; It's Cool to Be You reinforces positive differences)." "A great addition to The Playground! 14 songs that are full of humor, irony, and fun. Starting with the very first song titled Put On My Seat Belt, Leeny and Tamara do a great job of making important every day tasks seem fun and easy. The CD case also features unique artwork with all of the song lyrics so that you and your children can sing along with confidence." "Leeny and Tamara present 14 kid-pleasing tunes in swing, rock, pop, folk, and country musical styles. Several musicians perform excellent background music on keyboards, guitar, bass, saxophone, clarinet, flute, ukulele, percussion, drums, and fiddle. Tamara's sweet, almost girlish voice soars on I Used to Be Shy. The duo's wonderful harmonies are showcased on Singing Beach. Ladybug, Ladybug, Ladybu-u-ug and Your Epidermis Is Showing have driving beats that will get kids moving. Listeners can easily learn all 50 state names in Across the USA. While this album is very kid-friendly, the music is sophisticated enough to engage adults as well. An excellent purchase." "You can tell these ladies had fun making this CD. Ilene (Leeny) Altman, a Gloucester resident, teamed up with her longtime friend Tamara Hey to create 14 catchy tunes that your kids will love and learn from. From the inspirational It's Cool to be You to the zany I Came Out Backwards, our personal favorites are Little Sister and Hold It (hint: think potty time!)." "I LOVE it!!!! Seriously good. My kids just love it too. Quality, intelligent kids music." "My almost 6-year old and 2 1/2 yr old girls love their Leeny and Tamara CD. It's stylistically diverse and the melodies are catchy and easy to sing along to. Besides being well written and produced, what sets it apart from the the rest is that it's accessible to a wide age group of kids. Some children came over the other day ages 1 to 12 and everyone was dancing around. Some favorites are Put On My Seat Belt, Ladybug, Ladybug, Ladybu-u-ug, It's Cool To Be You, and Across the USA. I highly recommend Leeny and Tamara!!" "Leeny and Tamara rock kids' music! This is an album for kids, right? The answer is a resounding 'Yes!' Just witness how my nine-year-old and her friends play it over and over in the car as we buzz around town. Compelling beats and ecstatic melodies... it's the only children's record I've kept playing in the car after dropping my daughter off at school -- all others are history the minute she's safely inside. Give me a loud rendition of the rocker Ladybug, Ladybug, Ladybu-u-ug or the musical travelogue Across the USA from this album over depressing angst-ridden alt or 'too cool for you' college rock anytime. Good singing and good lyrics are my thing, and both are here in abundance. My favorite track is the wonderful My Baby, a love song from parent to child told with plenty of references to the young of quite a few kid-friendly animals. Confession: I get a bit misty when I hear it, thinking not only of my own kids but of the universal bond between parents and their offspring -- and it still has that effect after multiple, multiple listenings. My rating -- as high as they come. Get a few copies for all the kids and parents in your family." "When we played the CD it in the car for our 12-month old daughter, she immediately started bobbing her head and laughing. We'll definitely keep playing it for her and enjoying it!" "I'm a teacher, and I have used songs from Leeny and Tamara in both a classroom setting as well as in private lessons. The songs are a hit for both! Fun, catchy and smart, the kids love them, and actually... so do the adults! (I can attest!)" 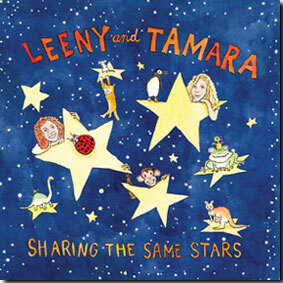 "Leeny and Tamara's Sharing the Same Stars and Leeny and Steve's Be Nice CDs are filled with great sing along songs that are easy to remember, encourage participation, and contagiously spread happiness among listeners." "I love it. Great choice of subject matter. Leeny and Tamara have come up with, and executed a very cool thing." "Great songs, great singing, great sound... but most importantly, when this album starts playing, my 15-month old daughter IMMEDIATELY starts movin' and groovin'. Makes any long road trip a pleasure and equally great to have on in the house. Highly recommended!" "Leeny and Steve kick it old school... Be Nice stands out in the 2008 kids' music market because it actually sounds like an album for children. This point was driven home for me as I watched my two-year-old daughter react to it... my daughter has always loved music, but I've never seen an album hold her attention right away like this." "Their simple, clean production keeps the performances low-key and intimate." "Original pop songs with great musical accompaniment that will have kids dancing along. Songs are in a variety of styles, which shows the versatility of the artists. Teachers may want to adopt some songs for school assemblies." "Leeny and Steve score on their debut album with 16 original tunes that have real kid appeal. The lyrics teach, but never preach. Several cuts deal with behavior. Many songs will be useful during story time." "Entertaining and helps parents teach kids about life etiquette. Smart, well-written lyrics and upbeat melodies. Lively music for car rides or play dates, and does not take the intellect of an adult for granted."